A sacrament is an outward sign of an invisible spiritual reality. Because humans are a unity of a physical body and a spiritual soul, God uses the means of physical objects and rituals to convey spiritual truths that we cannot detect using our senses. This outward sign functions as a channel through which God imparts sanctifying grace into the soul. The sacraments are seven in number and have their source in the saving work of Jesus in His passion, death, and resurrection, and were established by Him for the sanctification of every member of His Church. Sacraments are external rites performed by the Church that we experience both physically and mystically. Through them, God imparts actual divine grace (participation in the divine life of the Holy Trinity) which enters into our soul and transforms (sanctifies) us, helping us to live a life pleasing to God so that we can spend eternity with Him in heaven. Through the sacraments, the supernatural moral virtues are also infused into our souls, giving us the grace we need to overcome sin and to live a life ruled by faith, hope, and charity with increasing perfection throughout our lives. In a nutshell, "Sacraments are outward signs of inward grace, instituted by Christ for our sanctification." 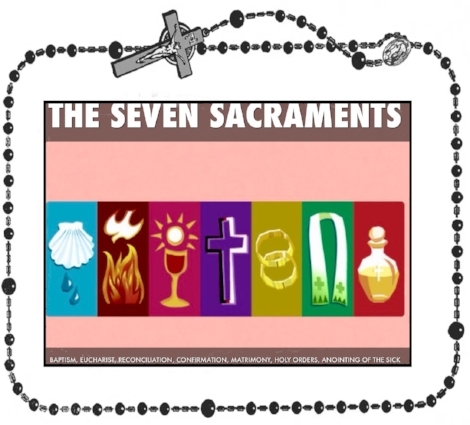 Why are there Seven Sacraments? Because of this broad inclusion of all stages of life from birth to death, it is fitting that there be more than a single sacrament that corresponds to each. This is for our benefit so that we can know that God is always with us, that He sustains us through all the stages of our lives, and that His grace is always working to save us through His Church. The number seven is also a spiritually significant number. It appears in many biblical passages and is associated with perfection or completeness. For example, God rested on the seventh day after creation; there are seven gifts of the Holy Spirit, Jesus spoke seven last words from the cross, etcetera.